My mother, a retired teacher, used to make these with her students every year. 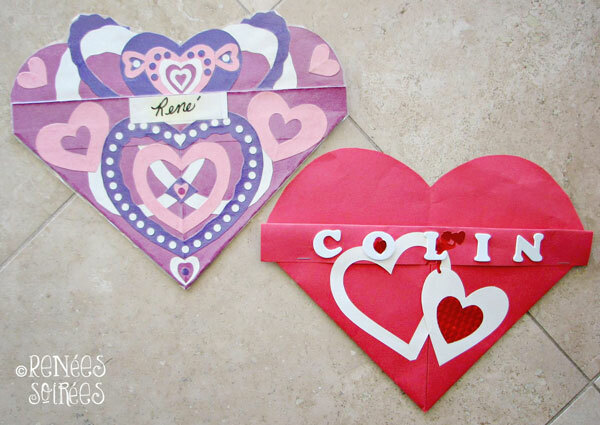 She hung them on the bulletin board for February decor, plus during the Valentine’s party, classmates could add valentine cards to the pockets. Here are some examples of the finished product. My mother, the most creative person I know, made all but one of these (you will know which one is mine, because I am missing part of that creativity gene). 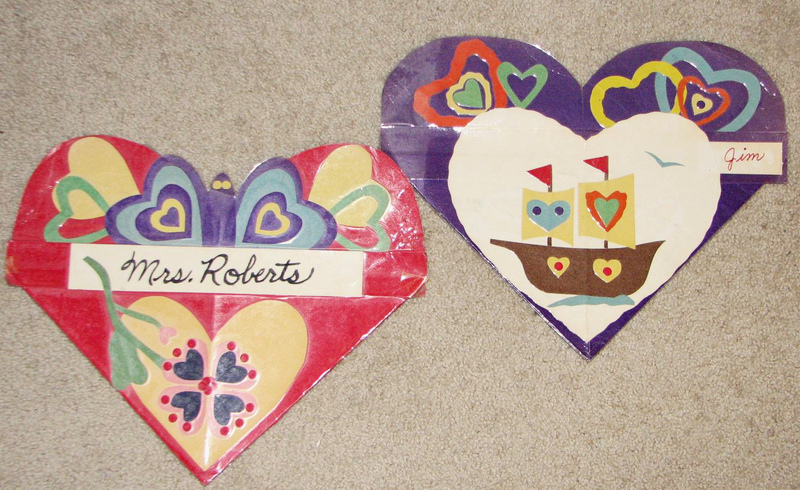 She challenged her students to incorporate hearts into everyday items (notice the butterfly and ship below). You can see better on the red heart above, how these open and act as a pocket. Mom made hers more than 40 years ago, and after about 20 years she decided to extend their durability by laminating them (then you need to use a craft knife to cut the pocket open again). Mom hangs these on the mantel every February even now, and they have held up just fine. I have also done them with younger kids, too (first grade). I just help them with the stapling, so they won’t staple in such a way that it prevents it from being used as a pocket. And for any age group, you can use a salad plate or manila folder template to help them draw the half-circle that becomes the top of the hearts. Use a toddler plate or something that is approximately the same distance across as the folded paper, otherwise your heart will look cut off. Use reusable adhesive aka mounting putty to attach it to your walls, mantel, desks or chairs (Scotch and Elmer’s make the putty in the US, and it’s called Blu-Tack in Australia). You could use tape in a pinch, but in a classroom setting, these pockets can get a little heavy for that. Here is the tutorial. Click the photo to save or print a PDF version to use as a reference (but trust me, these are NOT hard to make). I think it’s the coolest thing ever, that I hang (on my bannister, with a heart garland) the very same pocket that my mom used to put my Valentine’s Day card in when I was a kid. And I intend to pass along the ones I made for my kids as well. 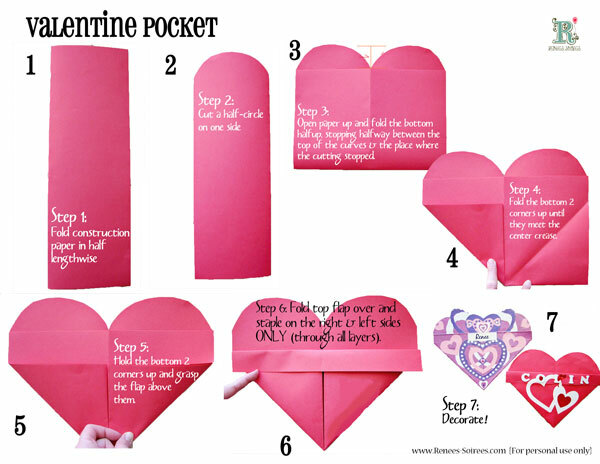 I featured your Valentine pockets today at Project Queen. Thanks so much for linking it up to the party. nicely done – i love paper crafts and this is no exception.